Modern nibs can offer some line variation, too. I know, this is a blinding, bright pen, but it has a fun nib. That’s an extra-fine that offers some line variation, in case you want a little but don’t want a full flex nib. (Why you wouldn’t want both is beyond me!). 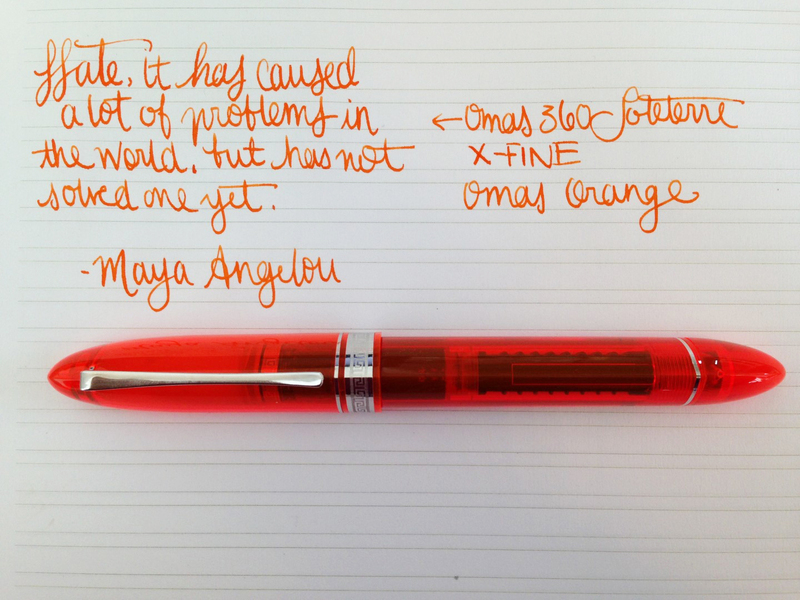 I think this is a great quote, a superb, fun pen, and a lovely nib. I also think writing things down, and writing to pen pals, can help deal with negative feelings! This entry was posted in Vintage Pens and tagged Handwritten Post, Omas, Quotes. Bookmark the permalink. Follow any comments here with the RSS feed for this post. Post a comment or leave a trackback: Trackback URL.